Spacious suites free breakfast complimentary Wi-Fi and U.S.-101 location two-and-a-half miles from Levi's Stadium are among the top draws at the non-smoking TownePlace Suites San Jose Santa Clara. The five-floor TownePlace has 107 spacious studio one- and two-bedroom suites all with separate living and sleeping areas full kitchens free Wi-Fi and flat-panel TVs. The entire property is non-smoking. Before heading out the door take advantage of the free breakfast. You'll also find a fitness room business center coin-op laundry and free parking on-site. Small pets are allowed for a fee. The TownePlace Suites is off U.S.-101 one mile south of California's Great America and two-and-a-half miles south of Levi's Stadium new home of the San Francisco 49ers. Downtown Santa Clara is three miles southeast and downtown San Jose is six-and-a-half miles southeast of the hotel. 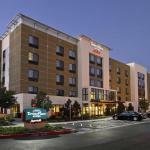 If you're coming from Mineta San Jose International Ariport the hotel is five miles northwest.